1) Are you done with training, will you graduate soon, or do you have years of training left? 2) Which companies did you apply to and why? 3) Who did you eventually refinance with and why? 4) What loan did you choose (fixed vs variable, 5 vs 10-year etc) and why? 5) What tips do you have for someone considering refinancing? Here are their responses and tips. David Michael Fredric Anderson is an attending who applied and refinanced only with SoFi and chose a 10 year fixed loan for “a good mix of liquidity and acceptable rate” and feels like he can always pay extra if he wants. He recommends you shop around (even though he didn’t) and advises there is no reason to pay 6.8% interest if you’re actually paying off your loans. 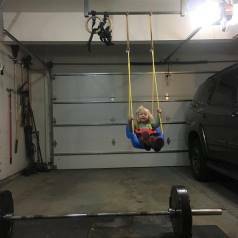 Sometimes you have to get creative just to get a workout in. Patrick Hussey is a PGY4 anesthesia resident in NYC who applied to SoFi and Laurel Road a while back. 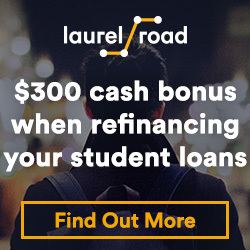 He was declined by Laurel Road felt his application was on hold for multiple weeks at SoFi, so he “refinanced” his $80K in student loans through his parents’ HELOC. It was a 5 year HELOC at 3.75% and he has already paid it off. His recommendation is to “just do it” since he dropped his rate from 6.9% to 3.75%. A new attending applied to SoFi (“because their advertising is omnipresent”) and Earnest (“because a friend had refinanced with them”) and went with Earnest because the rate was lower (3.5% for a fixed 7 year). Due to the low rate, he actually revised his original plan (pay off his $240K loan in 2-3 years) but still plans to pay it off at least a year early. He liked Earnest’s “slider tool” that allows you to see the APR for a given payoff term length. Since there was a special rate for 7 years, he took that. He also didn’t want to overcommit to a short loan length with a baby on the way and a 15-year mortgage. With his current $5K/month payments, he expects to get out of debt by 2026 but hopes to make more money sooner and pay them off quickly. His tip had nothing to do with student loans but more with income – “Beware of partnership buy-ins, whether sweat equity or cash” as they impede your ability to pay back loans, especially if you give up significant income to be in that partnership track and then it doesn’t work out. A PA and his sonographer wife refinanced their $140K/$30K in loans with SoFi first and then Laurel Road. They currently have a 2.99% 5-year variable and a 3.5% 5-year fixed. He actually recommends NOT combining all your loans into one big loan because it gives you more options to refinance with smaller loans. 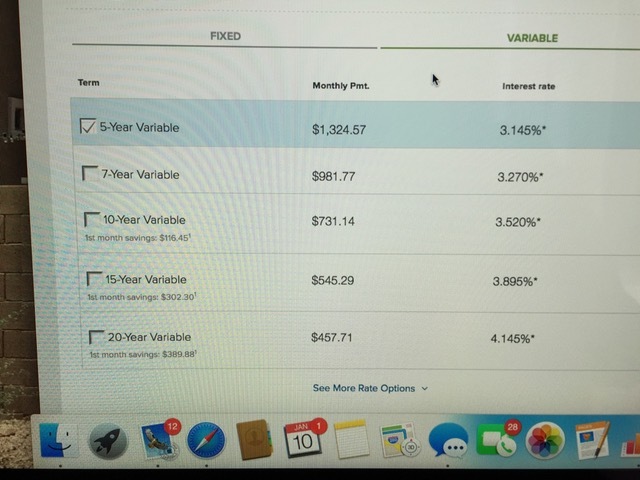 He actually sent me a screenshot from SoFi of the rates they were offered for variable loans. 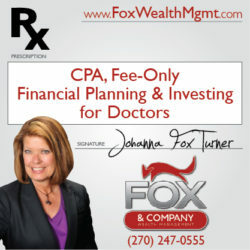 One doctor refinanced in October of his senior year of residency, choosing Link Capital due to the personal attention of a representative who called him up a couple of days after he started but didn’t complete an application. “She was knowledgeable and detailed in her responses to my questions. It was this coupled with lower rates that made my decision fairly easy.” The residency loan was a 7-year fixed at 4.42% in late 2015. He then refinanced again with Link Capital as an attending, a 5-year fixed at 3.62%. Laurel Road had by far, the easiest application and fastest turnaround time with a competitive rate. Earnest and SoFi also had easy and straightforward applications but slower response. ELFI was AMAZING with their customer service and actual persons worked with me. Common Bond was complicated and Link Capital was impossible. Their system to upload documents is so convoluted, too generic to give any direction, all communication was a stock email, not helpful. I would have been reluctant to go with them even if they did give the best rate. I would say it was infuriating working with Link Capital. Even over the phone, I would be redirected to various departments and then referred back to the website. In the end, Earnest, Laurel Road and ELFI gave me the best rates. I emailed all three and asked if they can beat their competition. Earnest claimed they would but did not. Laurel Road lowered their rate by 0.03% and ELFI by 0.08%. I went with ELFI. Of note, Sofi said they would only “match” another company’s rate but not beat it. I have applied to every company. Kind of a pain, but worth it. That is until you get to ELFI. It was positively the worst online application for anything I have ever done. I mean like AMCAS effort. Customer service is completely uninformed and the entire webpage is incredibly cumbersome. Gives you one rate and then a dramatically different one after you go through six more steps than any other lender’s appt. I have no idea how to reconcile those two experiences. The good news is that I get fewer and fewer customer service related complaints/comments every year despite having more and more readers refinancing. So I think every company is improving and competing as they go along. I’ve got another 100 of these emails, so perhaps we’ll have a part 3 in a few months. What do you think? Have you refinanced your loans? Why or why not? Who did you use? What rate and loan did you get? What was your experience like? Comment below! I agree with the take home to apply early, often, and to multiple companies. I think that I applied to three or four lenders (Commonbond, SoFI, and Earnest come to mind). Unfortunately, I hadn’t had my financial enlightenment yet. So, I didn’t do this until the end of my fellowship year. 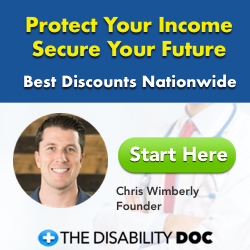 I liked Commonbond’s language regarding death and disability and they allowed me to combine my wife’s 40K from grad school with my 150K from medical school. I am kind of in shock about that pediatric surgeon who had $650K and decided to refinance. I would have advised that person to seek PSLF since it’s a 7 year training period and many pediatric surgeons work at academic medical centers. So, even if they had not figured out their financial bearings until later in their training, it seems like that still would have been worth it. Yea, you’d think a doc with a 6-7 year training period could find a way to work at a 501(c)3 for 3-4 years, but bear in mind at that debt level a fair amount of the debt is private loans, which aren’t eligible for PSLF. So happy I made the list! Even though I have been student loan free for a short amount of time (5 months) it seems like an eternity of awesome. As you eluded to, I did actively try to maximize any benefit from paying off student loans. I am a firm believer in passive investing, but as someone who likes to be active in most things, I found actively managing student loans both fun and proved financially rewarding (separate from just money saved on interest). Love the part about an eternity of awesome! Didn’t PIMD publish that article? That seems familiar. No. This post is original. PIMD articles are run here about every other Saturday. It was taken down after an affiliate relationship with credit card companies was made with PIMD. I understand why from a business perspective, and appreciated the opportunity to write a guest post. PM me in the forum and I can send you a copy. 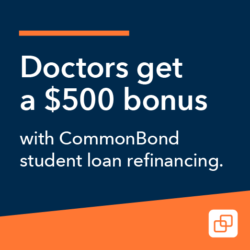 Conventional wisdom used to be to refinance once graduating residency, but with the advent of resident payment plans (3 that I’m aware of), as long as someone is sure they’re not going for loan forgiveness, do you agree refinancing at the beginning of residency is the best option? You have to consider the fact that, as a resident you’re not going to get rates that are as good as when you’re an attending. Seems most people get in the 4 and 5 percent range when refinancing during residency. If you are enrolled in RePAYE, it may be more advantageous to hold off on refinancing. Like in my case, my total interest rate is 6% on my $380K in student loans. Under the terms of the repayment plan, my required monthly payments are currently $0.00 per month, and the guvment subsidizes half my interest. That makes my effective interest rate 3% at this time. It does not currently make sense for me to refinance. As my income goes up in residency and as I start moonlighting, my required payments will increase and that interest subsidy will decrease, and I’ll have to reassess if refinancing is right or not. But for now, RePAYE saves me more money than refinancing could. Exactly. That should be the case for many residents on their direct loans. They can still refinance the private ones, of course, and for those married to a higher earner who aren’t getting much of a subsidy, it can make sense assuming they’re not going for PSLF. There are currently four companies with what I consider a true resident program- i.e. an artificially low payment. No, you don’t have to wait. You can refinance every month if you want. 45 year old internist. Due to some crazy snafu, my loan company kept insisting that I have paid back my student loan, even though I still owed close to 48K. All this came to light when I tried to refinance my loan about 8 years ago. Finally had to hire an attorney, and have a letter from the company stating that my loan has been paid in full…. Anyway, it has been mnay years my credit report is clean, and no one has has contacted me about it. That might be the coolest “forgiveness” story I’ve heard of. I think I’d do what you did- try a few times to get them to take my money and then walk away with a clean conscience. My wife and I are both physicians. I am finishing my fellowship this month and my wife has another year. She has $80,000 in loans. We’d like to refinance them now that I will be making substantially more. Does anyone know of a refi company that will allow co-signer (me) to get lower interest rates? Yes, most of them will allow a lower rate with a co-signer. There is some risk there, of course. Normally the loans go away at the borrower’s death, but if you co-sign, they become yours. Easy to insure against, of course, with a little extra 5 year term insurance. Just make sure you do so. My wife is a speech therapist, I’m a chiropractic neurologist. We ended up refinancing with First Republic based on WCI’s recommendation. We couldn’t be happier. I’ve refinanced three times throughout the last several years since I graduated.. This being my third time. Consolidated my wife’s 60K with my remaining 100K (I started at $247,000). Wife- cut her interest rate from 6.8% to 2.3%, AND cut about 3 years off the length of the loan. Saving about ~17K Interest 🙂 which is getting invested. Myself- was able to reduce my rate from 6.8% to 4.5% a few years ago (With SoFi). SoFi wouldn’t refinance my wife’s with mine, which is why we left and left to First Republic. With FR, went from 4.5 to 2.3%, actually letting my stretch the length of the loan out another 3 years, without it costing any additional in interest. This will allow me to invest more heavily into our retirement account for the time being. We’re really happy with them. Hope this helps. I echo Jonathan and wholeheartedly recommend First Republic. Best rates in the whole student refi market, the main trick is living near one to qualify plus the usual loan qualifications. Great customer service! Easy online application. AND they don’t sub-out the student loan servicing to a third party vendor (boo Sallie Mae, FedLoan, etc.). No regrets from me – only wish I had found them sooner.